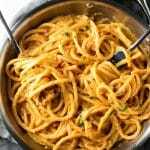 A simple, easy-to-make sun-dried tomato alfredo sauce tossed with pasta. It’s what to make on those nights when there’s just no time to cook. Three cheers for 5 ingredients! Or maybe 5 cheers are in order because this creamy, comforting, and easy pasta recipe not only has just 5 ingredients, but it also takes less than 30 minutes to go from pan to plate. We’re taking a simple jar of sun-dried tomatoes and combining it with cream, butter, and parmesan cheese to make a sauce that clings to every strand of pasta. In this case, I used bucatini, a thicker-than-spaghetti pasta, that stands up to the sauce with a toothsome bite. 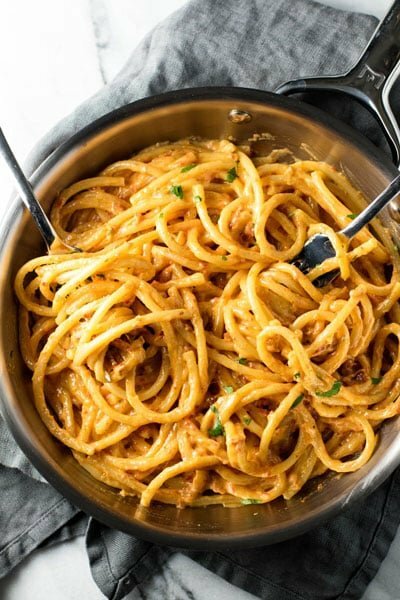 With the weather turning colder and the schedules getting busier this sun-dried tomato alfredo is a happy, happy thing. It’s a recipe that will save dinner on those nights when take-out orders or drive-throughs pose a real threat to our cook-our-own-dinner best intentions. Look for jarred sun-dried tomatoes pack in oil. Go ahead and puree the whole jar in the blender, you’ll only use 1/4 cup of the puree for this recipe, so save the rest of it in the fridge. Spread it on sandwiches, whisk it into salad dressings, or stir it into your next batch of spaghetti sauce. Bucatini pasta works so well with this alfredo, but other long pasta will work fine, too. That’s it! A 5-ingredient dinner idea to help start your week off right because we all need a creamy, cheesy pan of pasta every once in a while, right? C’mon, you know you want a bite. Add the cream and butter to a skillet. Bring it to a simmer over medium heat and stir until the butter has melted. Add the pureed sun-dried tomatoes and continue stirring. Let the sauce thicken. One the pasta is cooked, transfer it to the skillet using tongs or a pasta spoon. Add the parmesan cheese and toss the pasta in the sauce until it’s well coated and the cheese has melted. 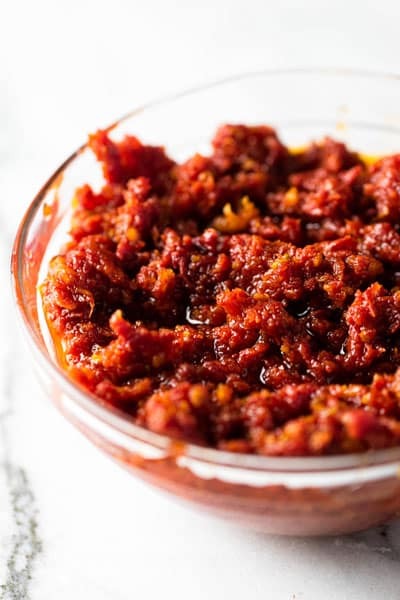 I recommend buying an 8.5-ounce jar of sun-dried tomatoes packed in oil and pureeing the whole thing using a blender. You will have leftover pureed tomatoes, so save the unused puree. Use it on sandwiches, or add it to tomato sauce for another pasta dinner later in the week. It’s also delicious stirred into soups. Very good!! Doubled the recipe and kids even gave it a thumbs up! Yay! Happy to hear it’s kid approved – thanks for letting me know! the original alfredo does not have cream (look up cacio e pepe, and the history of Chef Alfredo and his specialty is a good readj. that aside, this is a fun dish to make and eat! Ah, yes! I’m familiar with the original – I have a version on the blog after I tried Mark Bittman’s cacio e pepe from the NYT. Although, I tweaked mine with a little roasted garlic 🙂 I guess my Alfredo is Americanized! This is one of the best dishes that I have made in a long time. My 27 years old son makes this all the time because it is so simple. Never tried sun dried tomatoes before now it a staple in my house. Thank you! I’m so happy that you and your son like it 🙂 Thanks so much for letting me know! I came across your blog on Pinterest and made it tonight. It was AMAZING! I made fresh noodles to go with it and it was seriously so unreal. Can’t wait to try another recipe! This looks so silky and delectable! Definitely making this! I’ve never thought to do this and I love it! I’m making this for my family for dinner for sure. Love it! This looks great! I love sun dried tomatoes. 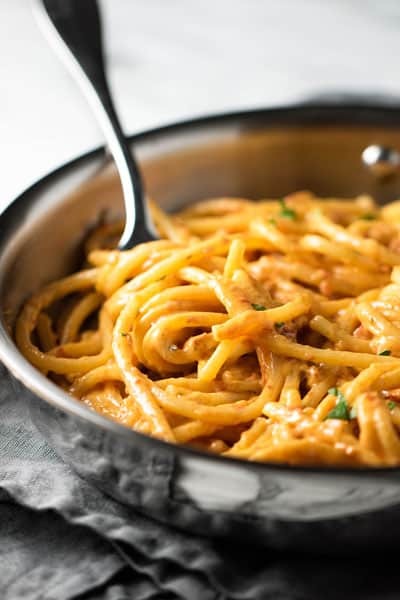 I can almost taste that creamy, sun-dried tomato sauce and perfect pasta! Yum, this one sounds great! Perfect for a crisp, cool fall evening meal!